A closer look at who attended a private signing ceremony finds some cheerleaders for discrimination. Indiana governor Mike Pence insisted in a national interview today that the law he signed was never about discrimination, but GLAAD suggests it has proof otherwise. 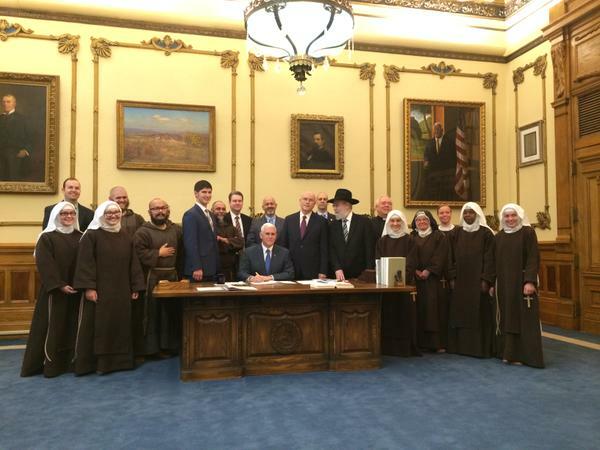 A photo (pictured above) that the governor shared from the private ceremony this week when he signed the Religious Freedom Restoration Act includes among the crowd three well known antigay lobbyists. All three are listed as part of GLAAD's Commentator Accountability Project — a list of pundits it warns news networks against booking as guests because they're extremist on LGBT issues. A user on Twitter zoomed in on the image and found the trio, then shared an image of his own with a pretty straightforward message: "When Mike Pence tells you SB101 isn't anti-gay, he's lying." It used the GLAAD information to make the point, and GLAAD shared it via its own social media. Pence said repeatedly during an interview on ABC's This Week that his law is victim of "misinformation" about its true intention. "I was proud to sign it into law last week," he told ABC's George Stephanopoulos. "But look, I think — I understand that there's been a tremendous amount of misinformation, misunderstanding around this bill. I'm just determined, I appreciate the time on your program, I'm just determined to clarify this. This is about protecting the religious liberty of people of faith and families of faith across this country." Watch the complete interview. Check out the image GLAAD shared on Facebook below.